With a steam room a sauna and a location within walking distance of Leidseplein museums and Vondelpark the NH Amsterdam Centre is a hub of convenience in the center of the city. The seven-story NH Amsterdam Centre offers 232 rooms with hardwood floors minibars coffeemakers safes and a selection of pillows. Non-smoking rooms may be requested. There are two on-site restaurants. Beat jet lag in the sauna the steam bath the hot tub and the fitness room. Currency exchange is available at the hotel. Airport shuttle is available for a fee. Parking is available off-site. 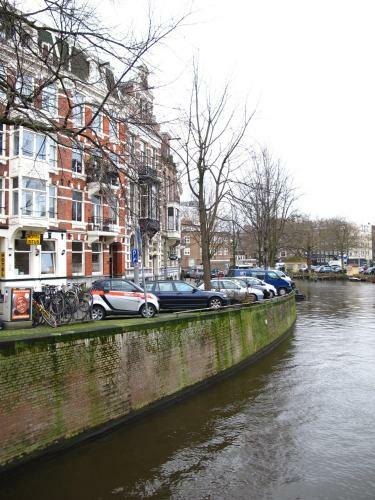 The hotel is located in the Leidseplein district a five-minute walk from the P.C. Hooftstraat shopping area Vondelpark and the museum district home to the Rijksmuseum and the Van Gogh Museum. It is under one mile to the Heineken brewery and the Floating Flower Market. The Anne Frank House is 10 minutes away and so is the city's infamous Red Light District. Having a tram stop outside the hotel makes it easy to get around the city. It's two miles from Amsterdam Centraal Station and nine miles from Schiphol Airport.